Homemade peanut butter. It's so simple, yet I hadn't made it until now. What's wrong with me?! This must honestly be one of the easiest recipes I've ever made. The original recipe is from Texanerin Baking. 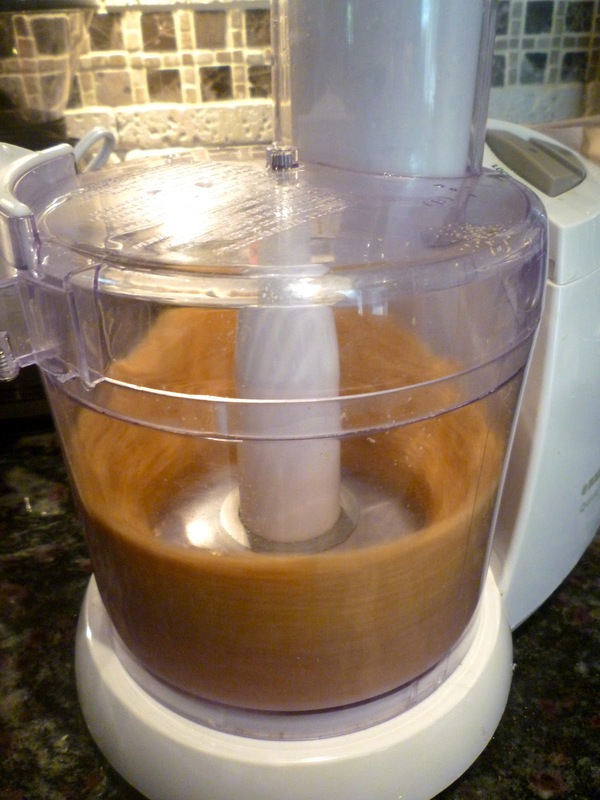 Put peanuts in food processor. Process until creamy. Ummm, that's it. No joke! It only took about 1 to 2 minutes for the peanut butter to reach desired consistency for me. Erin from Texanerin Baking says it takes about 4 minutes for her. So, just keep an eye on yours and check it every now and then to see how it's doing. When I tasted mine after no more than two minutes, it was great! Mike thought so too. So, I didn't process it any further. I think that in the future I will probably experiment a bit more and try to process it longer to see how that might differ. If you think you'd like to try adding canola or peanut oil, add it one teaspoon at a time until the peanut butter reaches the consistency you'd like. And feel free to add salt to taste too. And finally, 1 cup of peanuts makes about 2/3 cup of peanut butter. You can store it in an airtight container for up to two months in the fridge. I used unsalted, roasted peanuts, and Mike and I both liked the taste of the peanut butter as is. However, I can see where adding a little salt would be yummy too! When you first start processing the peanuts, they will become ground peanuts. As your food processor continues, the ground peanuts will form a ball. Next, they'll turn into a creamy, smoother product we like to call peanut butter! It seriously is like magic when it happens. :) I couldn't believe how quickly I went from peanuts to peanut butter! Things like this make me so happy. I'm such a simpleton. Peanuts turning into peanut butter...and I'm a happy gal. April 3rd: Let's Toast to Whole Grains!